House Bill No. 566 (HB566) was introduced in the Idaho House of Representatives on February 14, 2000. 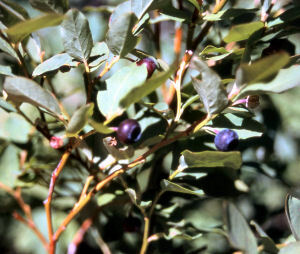 HB566, designating the huckleberry the state fruit of the State of Idaho, did not indicate a particular species, but several are native to the state. The most common, Vaccinium membranaceum, is widely understood to be the species intended as the official fruit of Idaho. It goes by many common names, including thinleaf or thin-leaved huckleberry, black huckleberry, mountain huckleberry, mountain billberry, tall huckleberry, big huckleberry, globe huckleberry, and even Montana huckleberry. The legislation, approved by the Idaho House of Representatives and the Senate, was signed by Governor Dirk Kempthorne on April 13, 2000. The law went into effect on July 1, 2000. The following information was excerpted from the Idaho Statutes , Title 67, Chapter 45, Section 67-4510. SECTION 67-4510. State fruit designated. The huckleberry is hereby designated and declared to be the state fruit of the state of Idaho. Huckleberries and Bilberries [PDF]: by Danny L. Barney, Ph.D. Confused about what a huckleberry or bilberry is? Vaccinium "Huckleberries": Purdue University - Horticulture & Landscape Architecture. Big huckleberry, Vaccinium membranaceum Douglas ex Torr. : Virginia Tech, College of Natural Resources: Department of Forestry - Fact Sheet. Vaccinium membranaceum (Thinleaf huckleberry): USDA, NRCS. 2004. The PLANTS Database, Version 3.5 (http://plants.usda.gov). National Plant Data Center, Baton Rouge, LA 70874-4490 USA. Vaccinium membranaceum Dougl. ex Torr. : Integrated Taxonomic Information System (ITIS) Here you will find authoritative taxonomic information on plants, animals, fungi, and microbes of North America and the world. Vaccinium membranaceum (Huckleberry): CalPhoto photographs. The Biodiversity Sciences Technology group (BSCIT), a part of the Berkeley Natural History Museums at the University of California, Berkeley. More symbols & emblems: Complete list of official Idaho state symbols. 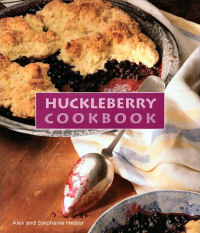 Huckleberry Cookbook , by Stephanie and Alex Hester. 128 pages. Three Forks; 1st edition (July 1, 2008) The very word huckleberry connotes wild places and wide open spaces, where prized picking sites are passed down from generation to generation. Bags of berries are a hot commodity at local farmers' markets - to be used fresh or hoarded in the freezer for use in the long winter to come. From Huckleberry Banana Smoothies to Huckleberry Beignets to Coq au Huckleberry Vin, Huckleberry Cookbook offers more than fifty ways to enjoy the sweet, ripe taste of summer for breakfast, lunch, and dinner, all year round.